The bespoke Play House, located in the Amphitheatre is a child's dream where they can play chef at the made-up café, pretend to cook at the sand kitchen, care for sick toy animals at the animal hospital and enjoy a story at the library. The Play House will also have a small sandpit nearby with plenty of natural materials that can be stacked and moved, allowing kids to create their own private den in the middle of Manchester. Not only will the activities provide hours of fun but the new facilities will also enrich the lives of children across Manchester. That's because playing creatively develops social skills, concentration, language and problem solving – all skills needed as children grow up and take their places in the community. Weekly free Forest Tots sessions were trialled in the tepee for 6 weeks before Christmas, and will continue on Tuesday mornings for 10 weeks from 15th January. Sessions are facilitated by a qualified Forest School practitioner, and are free to attend but places must be booked online via the link below. Centre Director for Great Northern Mark Schofield said: "Recent studies have shown that children in the city have fewer chances to play outside so here at the Great Northern we wanted to create a fun and safe space where children and parents can play, discover and most importantly learn vital life skills". 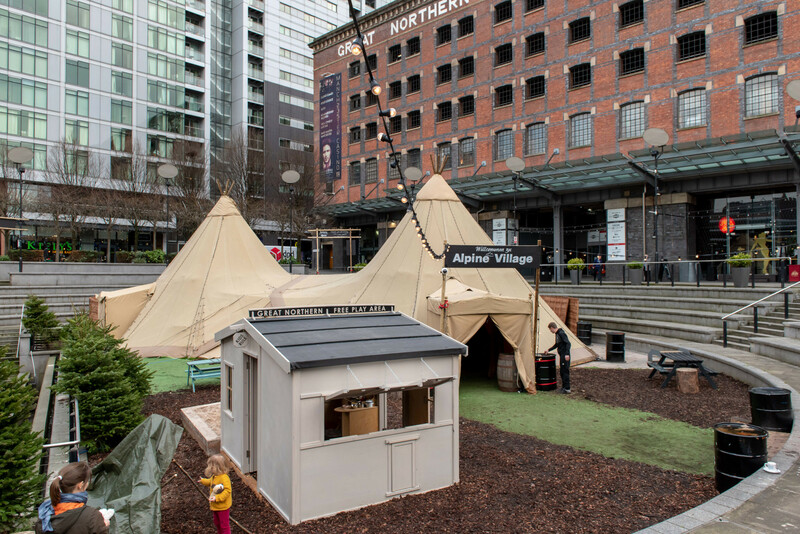 "It is also great to welcome the Play House to the Great Northern after the success of our free Forest Tots sessions, which will be running every Tuesday until Easter in our tepee, offering parents the chance to escape the hustle and bustle of the city centre as their children are inspired through creative stay and play sessions".